Happy Home Baking: Tart it Up! I remembered getting pretty nervous with the recipe as it was my maiden attempt at making crème patissiere or pastry cream as filling for this fresh berry tart. As usual, I tend to shy away with anything that has got to do with the stove. Before I set off to make the pastry cream, I checked the internet to get some idea how to really go about making it. The recipe makes it sound so simple, but I was certain that chances of me getting it right the first time would be very slim. I felt more confident after looking at the step-by-step photos from here and here. Even though I can't read the language in the second website, the pictures speak for themselves. I was so glad when I managed to 'cook' the pastry cream without burning it...well almost...I must confess that there was just a tiny bit of brown layer at one corner, right at the bottom of the pan ;) The pastry cream was very smooth and not lumpy, most importantly, it tasted very very good! It was way better than any custard fillings which I have tasted before...and I suspect some of those tart fillings that I have tried were made with custard powder. The original pastry cream recipe calls for vanilla seeds, I didn't want to take the risk to put my precious vanilla pods (a gift from vb) to waste, I flavoured the pastry cream with vanilla extract instead. I always fall back on this same recipe to make the pastry case...primarily because I think it doesn't use as much butter as compared to other shortcrust pastry recipes. The finished tart was dust generously with icing sugar...but it melted away as I was taking photos of the tart. That was because I have left the tart to chill in the fridge while I was doing the cleaning up. The strawberries were as tangy as usual (**sigh**), fortunately the icing sugar helped to make them less sour. 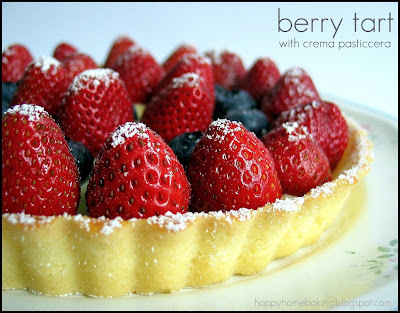 The pastry cream greatly enhanced the overall taste of the tart. It was simply delicious...light and refreshing...especially after it was chilled in the fridge. We had it right after dinner, and the four of us finished up 3/4 of the tart. We could have devoured the entire thing, but I insisted that we kept some 'leftovers' just so to make me feel less greedy ;) My husband was full of praises, which was something not to be expected on a 'regular basis". I didn't even have the chance to take a photo of a slice as whatever that was left was gone first thing the next morning. Form and shape the pastry into a round disc. Roll out the pastry in between 2 sheets of cling wrap or baking paper (I used two sheets of cut-out plastic bags) to about 23cm in diameter. Remove one side of the cling wrap/baking paper. Flip the pastry over the prepared tart pan. Remove the other cling wrap/baking paper. Mould the pastry into the tart pan, smoothing the edges and the rim carefully. If the pastry is too soft to handle, chill it in the fridge for 10~15 mins. Use a fork to poke holes (as many holes as you can) on the pastry surface. Brush the top of the rim with egg wash. Bake in pre-heated oven at 180 degC for 10~12 mins until the edges turned slightly browned. Let cool completely. In a saucepan, bring milk slowly to the boil and remove from the heat. In a mixing bowl, with a manual whisk, whisk egg yolks and sugar until the mixture turns pale and thickens. Sieve over the corn flour and plain flour. Whisk until the mixture becomes smooth. Add in the hot milk gradually to the yolk mixture, whisk constantly to prevent curdling. Pour the mixture over a sieve and return it to the saucepan. Heat gently, stirring constantly with a whisk or a wooden spoon until the mixture just starts to boil. When it boils, continue to stir constantly for another 1 minute, the mixture will become very thick and very difficult to stir. It is important to stir the mixture constantly as it cooks so that it thickens but doesn't turn lumpy. Remove from the heat and whisk in the butter and vanilla extract (or other liqueur such as Grand Marnier, Brandy, Kirsch, Rum as desired). Pour into a clean bowl and cover the surface of the pastry cream with cling wrap and set aside to cool completely. This is to prevent a skin from forming. After cooling, the pastry cream will be very thick. When ready to use, just whisk it with a spoon and it will become spreadable. Spread the pastry cream evenly onto the cooled tart case. Arrange strawberries/blueberries on top and dust with icing sugar. Best serve on the day it is made. Keep for one day if refrigerated. Note: for the pastry cream, I only made 2/3 portion as the original recipe is enough to fill a much bigger tart. As a result the amount for the corn flour and plain flour was a little unusal! This is such a so beautiful ! 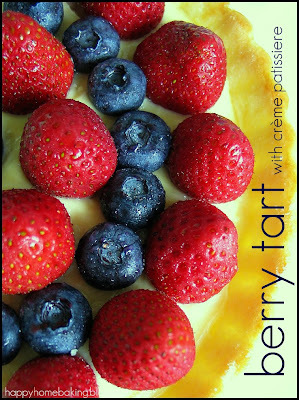 I am not a tart fan but the picture just make me drool! Hee hee, you have the same problem as our household... if you don't "chope" it, any leftovers be gone before you even know it! HHB, If I don't have almond powder, can I just replace it with more cake flour for the pastry case? Hi HHB, I've been waiting for this post ever since I saw the photo in flickr, looks really delicious. So the tartness of the fruit was ok when eaten with the pastry cream? Its such a lovely bake! But for me, let me stick to the basic basic steamed egg cake or butter cakes first .. no confidence in myself to bake this as yet cos i need more practise. Hi Julie, I have not tried replacing the almond powder with cake flour. Although I think it is possible, but I would suggest that you use almond powder as it really enhance the flavour and makes the tart very fragrant. Hi Yuri, sorry, I am a bit behind my blog posting ;) Yes, the tartness of the strabwerries was ok when eaten with the pastry cream. Thanks for the info on snow powder! This is my first time here. This is lovely ... lovely... lovely... The strawberries stand out so attractively. your tart is GORGEOUS! I am loving your blog! I baked this on Saturday, do not know what went wrong but my pastry cream did not thicken after cooling, not even after I chilled it for a couple of hours, it is still runny. Could it be because I over stir it while cooking cos I'm afraid of burning it. Nonetheless it still taste very good. I made a peach tart on sunday to make up, very yummy too. Hi HHB, your tart pictures look just like those you can find in those ang moh cookbook. So well taken. 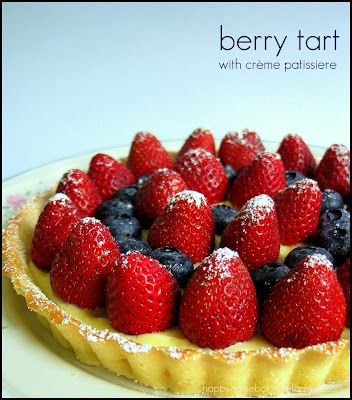 Love the vibrant colours of the berries on your tarts. wow, that tart really looks like it came out of a cookbook! Beautiful photography! hi this is the first time i came into ur blog and this z going to be a daily activity from today. i have been browsing thru all ur recipes all thru the afternoon. all the recipes were great and i must thank u for making my stomach groan with hunger for all the beautiful photos. I really enjoyed reading your blog and you are very good at baking and you share your receipes and views on your baking/cooking skills. Keep it up. It really makes my day especially when you are feeling very lousy..... I love baking and cooking too. Hi HHB, Each time, when I am feeling down, I will read yoour recipe and it really made my day. Keep up the good work........ thanks for sharing your receipe and final product with us. wish to ask the almond powder issit ground almond? Hi Elaine, yes almond powder is ground almond. wish to ask if i change from the whole tart to a mini tarts.. the temp and time still remain the same?? Hi Elaine, I have not tried making mini tarts, but the recipe says for a 7.5cm tart, the baking temperature is 180degC for 10-12mins. Maybe you can try baking at 180degC but shortern the baking time to 8~10mins? wish to ask whether this tart is on the harden type? just done the tarts .. make it into "mini" version.. find the tart shell kind of hard.. but overall its nice..
Hi Elaine, I have not tried making this into mini-tarts. The crust is firm but not the hard type. The texture is like soft cookies. I suspect you may have 'worked' on the dough too much when you shaped them into the mini moulds. Just like any cookie dough, if you add extra flour while you roll and shape, the dough will turn hard upon baking. Hi, HHB,your tart looks great. I have made these tarts third time yesterday, each time the tart pastry turned out a bit hard.Not sure why as I have tried to handle the dough as lightly as I can. Normally I will leave the dough in the fridge about 30min to 40min until it's very firm and tried to roll out into very thin pastry to fit the 9-mini tarts hole-pan. One question is do I have to beat the butter and sugar till it turn pale in colour just like making a butter cake? Anyway, I like this tart recipe as it uses very little fat and egg yolk, a more healthy version.Thanks so much for sharing this lovely recipe. I made this tart on Wednesday (the peach tart version), the pastry is not hard...it's like soft cookie. Yes, you have to cream the butter and sugar till the mixture turns pale and very fluffy. Do not dust with flour when you roll out the dough. You could have roll the dough too thin...into 9 mini tarts...maybe that's why the texture becomes hard? Maybe you want to try making a 18cm tart instead to compare? If you don't have a tart pan, you can get those disposable alum foil ones...available at PH. 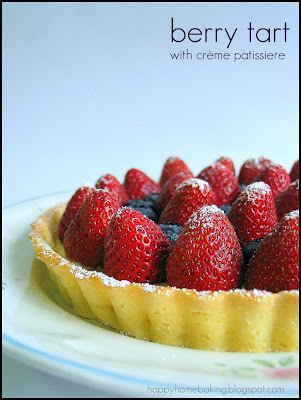 I like this tart recipe too, most tart recipes use way too much butter! Thanks for your reply.Will try again today coz still have some leftover pastry cream. Btw, my pastry cream was a bit runny like cream even I've cook for more than 1/2 hour, i was just too tired to wait till it thickens, but it tasted ok, anyway.I've put Grand Marnier for the pastry cream instead of vanilla,the taste is very subtle and hardly noticeable. Hi HHB, i baked this tart today. The crust is indeed very nice. I like it and i really like your detailed instructions. It is very helpful! :) But may I check with you, is the vanilla extract 1 tbsp or 1 tsp? My pastry cream seem to taste a little bitter though. I wondered is the bitterness due to the amount of the vanilla extract. Hope you can advise me. :) thank you. I used 1tbsp vanilla essence btw, not extract. Is there a difference? Where can I get vanilla extract? Thank you. :). Hi, I used pure vanilla extract which doesnt taste bitter, yes, I used 1 tablespoon. I got mine from the states, but you can try Phoon Huat, the brand is Nielsen-Massey Madagascar Bourbon Vanilla Extract. Hihi... i made the pastry and put it in the fridge. The next day the pastry becomes soft. Is it i didn't bake it long enough? Hi, did u cover the pastry crust or store it in air tight container before storing in fridge? it is not necessary to store the pastry crust in fridge it can be left in room temperature (cover with cling wrap or keep in air tight container). for this type of tart, the cream may cause the crust to soften, so it is best served on the day it is made.